Watersport carrier holds gear with rubber-coated, ratcheting arms - no need for load straps. Integrated locks secure your watercraft to the carrier. Includes clamp-on and channel mounting hardware. 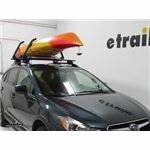 Lowest Prices for the best watersport carriers from Lockrack. 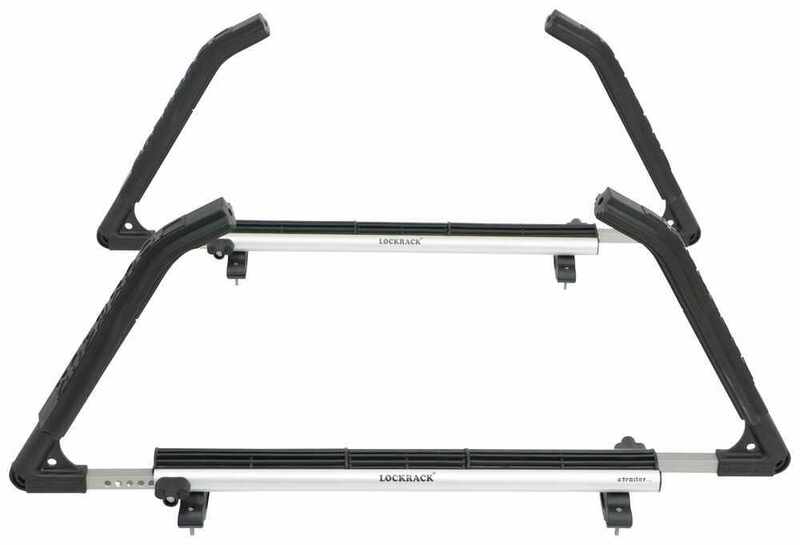 Lockrack Watersport Carrier - Kayak, Canoe, or 2 SUPs - Side Loading - Universal Mount part number 339LRUNISETA can be ordered online at etrailer.com or call 800-298-8924 for expert service. Watersport carrier holds gear with rubber-coated, ratcheting arms - no need for load straps. Integrated locks secure your watercraft to the carrier. 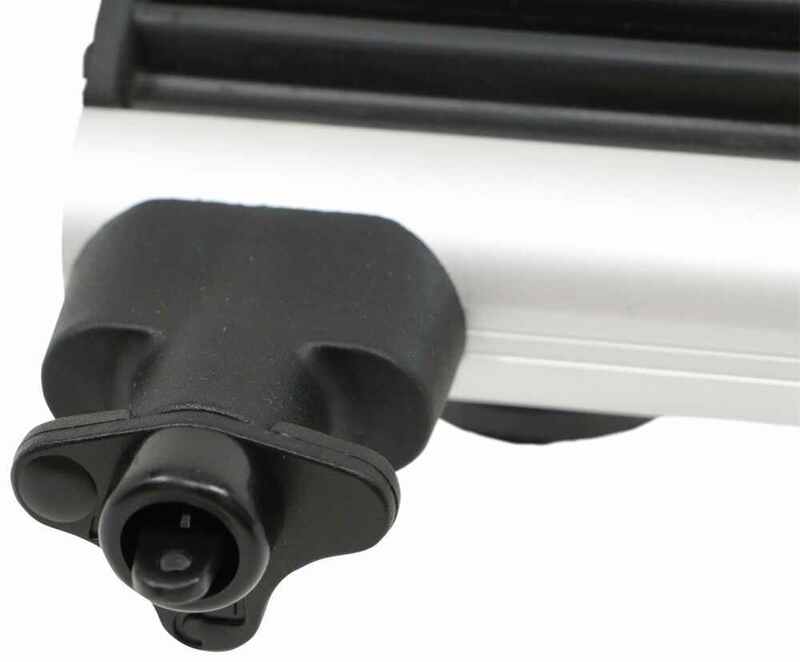 Includes clamp-on and channel mounting hardware. 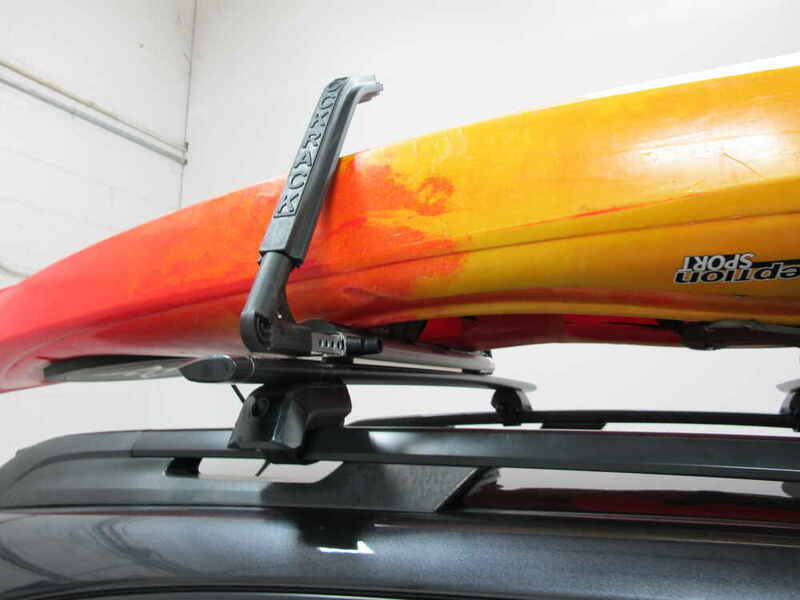 Flat position provides overhead clearance when not in use - reduces height to under 2"
The Lockrack watersport carrier lets you transport 1 kayak or canoe or 2 stand-up paddle boards on your roof rack crossbars without the need for load straps. 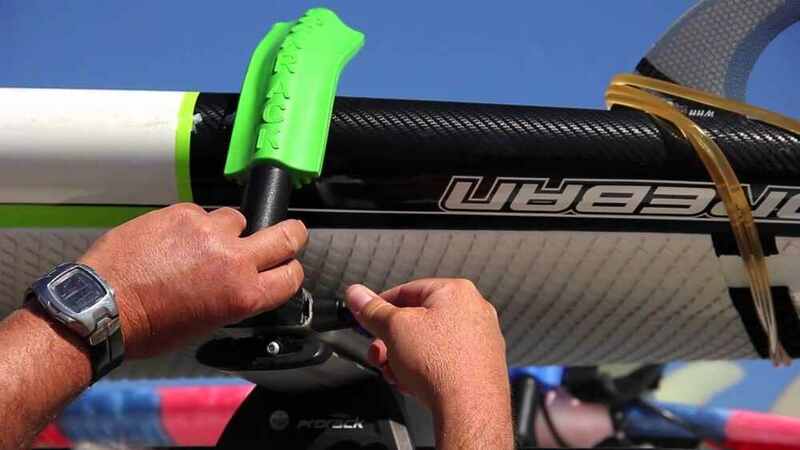 The rubber-coated arms can be adjusted to the width of your boat or boards and ratchet into place for a secure hold. Once they are set, the arms lock into place and can only be removed with the included keys, ensuring your gear is safe and secure. 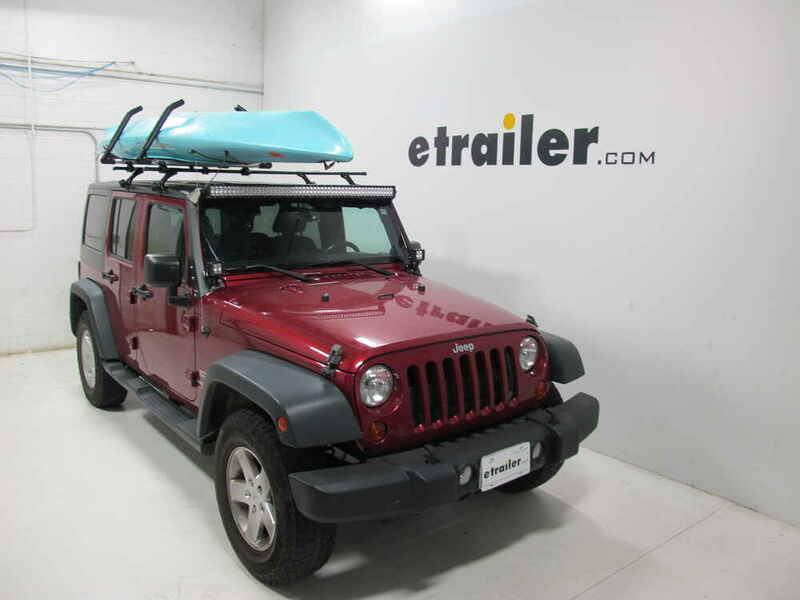 Because a single person can quickly and easily load the boat or boards onto the carrier, and since load straps aren't necessary, you'll spend less time loading and unloading your gear and more time out on the water. 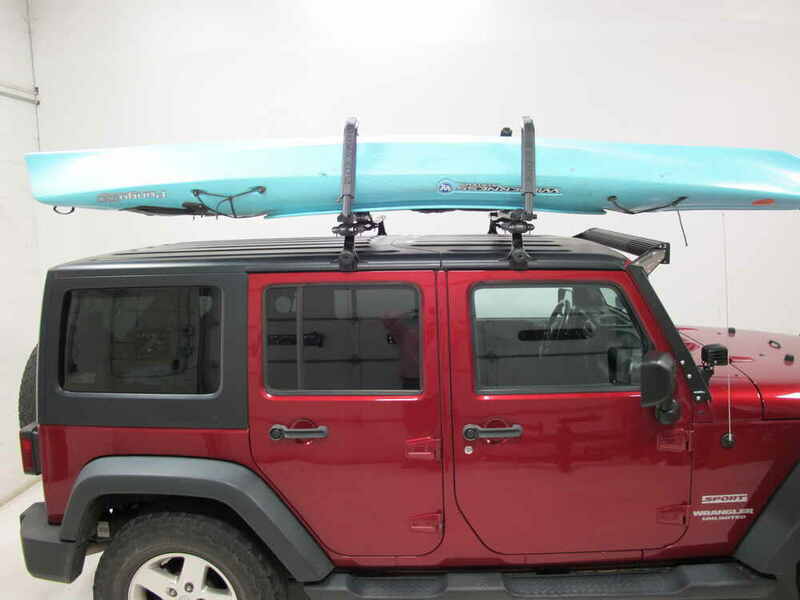 Loading a kayak, canoe, or SUPs onto the carrier is easy for one person to do. With the inner arms already installed, simply stack your gear on the carrier's base, making sure they're pressed against the arms. Then just insert the outer arms into the carrier and ratchet them down so they're sitting snuggly against your gear. 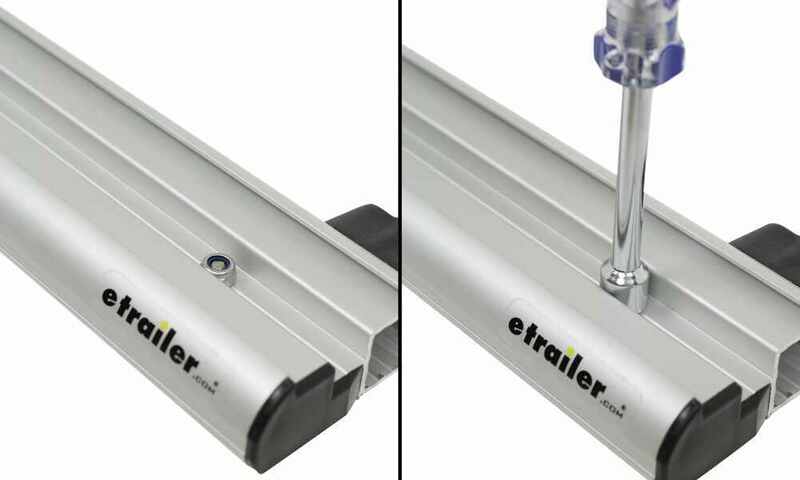 Once fully locked around your gear, the ratcheting arms' curved design creates a lateral and downward force, ensuring your boat or boards are secure and won't slide around. 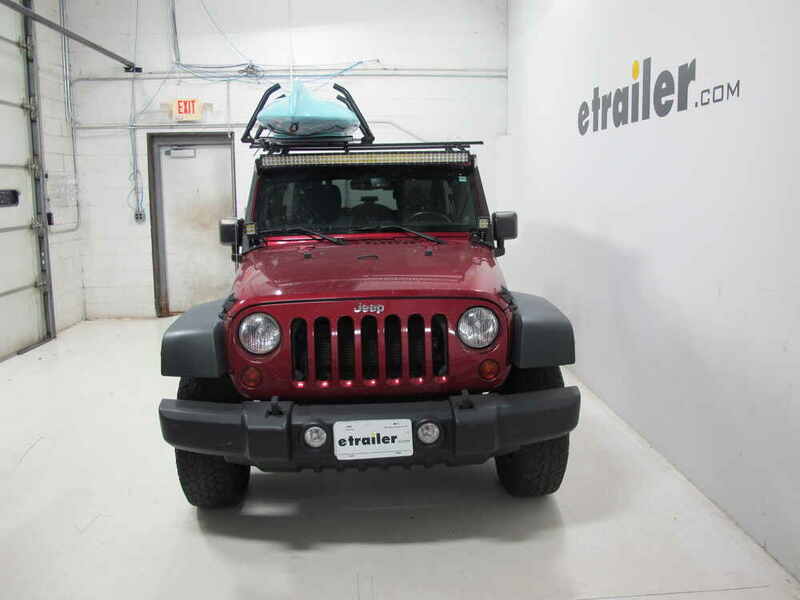 And because of this design, you don't have to use load straps to secure the boards to your roof. 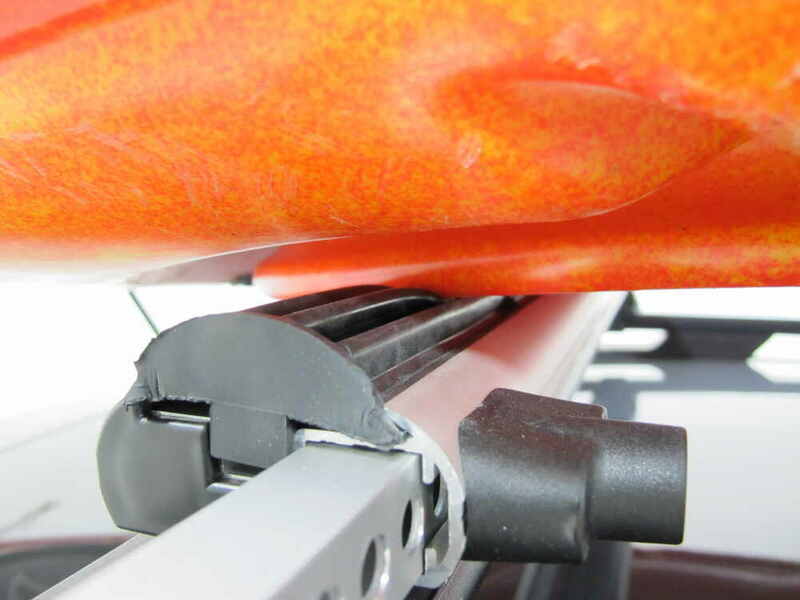 To ensure your boat or boards aren't damaged during transport, the ratcheting arms are covered with a rubberized sleeve. This rubber-coating flexes against the sides of your gear to protect them from scuffs and scratches, while still providing a secure hold. For longer gear and longer trips, we recommend using bow/stern tie-down straps (sold separately). Because the carrier holds your gear in the center, the bow and stern can be subjected to damage caused by high winds. The bow/stern tie-downs provide additional support to help protect against this type of damage. 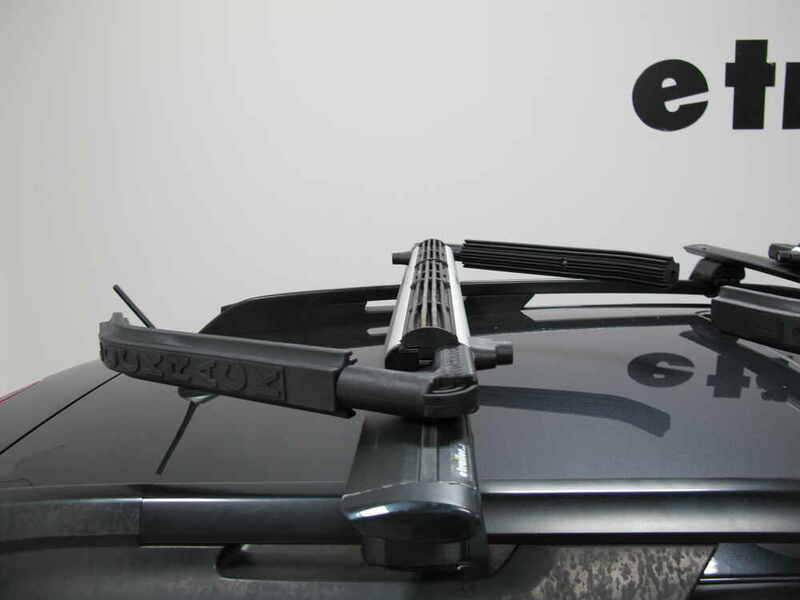 When not transporting your gear, the carrier's arms can be secured flat against your crossbars. 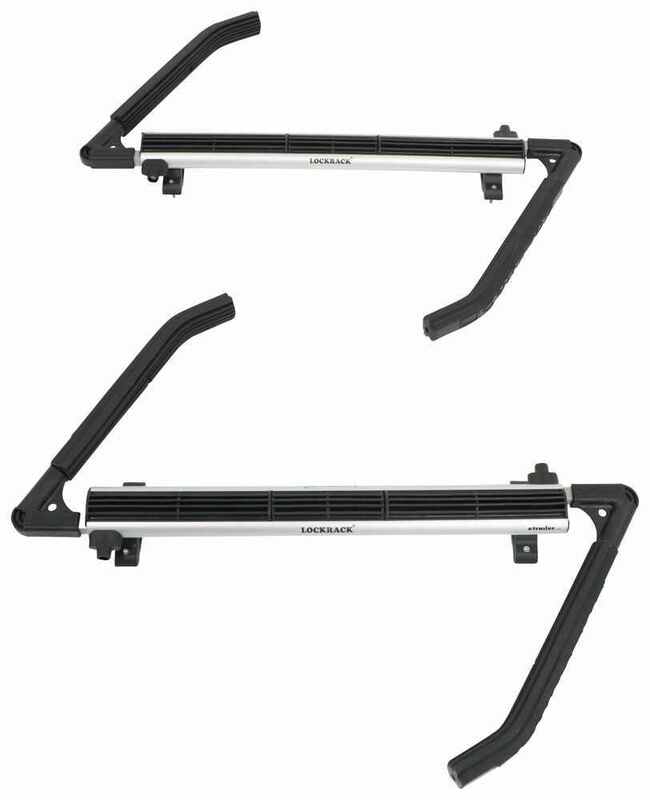 In this position, the carrier adds less than 2" of overhead height to your roof rack crossbars. This means you won't have to remove them when pulling into your garage. Four locking points secure the ratcheting arms and your gear to the carrier. When you ratchet the arms down, they lock in place and can only be removed with the included keys, giving you peace of mind when you're away from your vehicle and gear. For added convenience, the keys hook onto your key ring. 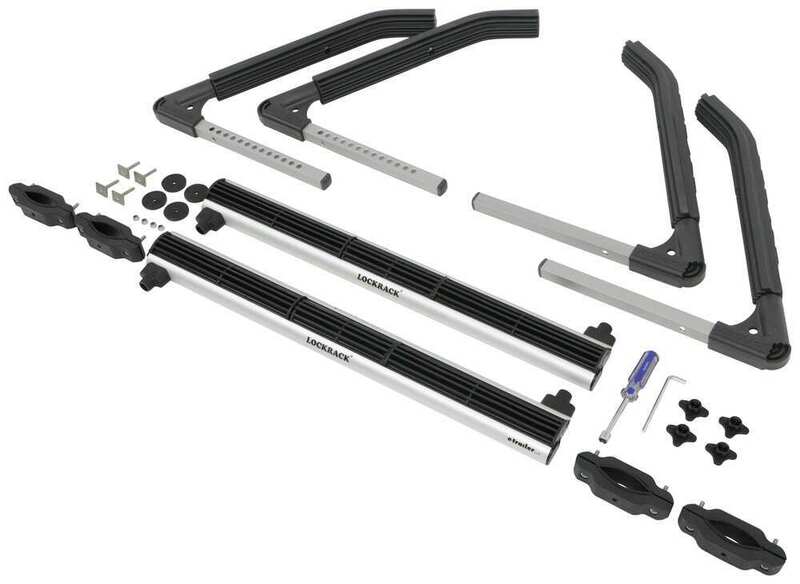 The rack installs quickly and easily with universal mounting clamps. Simply set the rack on top of your crossbars, attach the bottom portion of the clamp, and tighten the clamps down with the included tool. 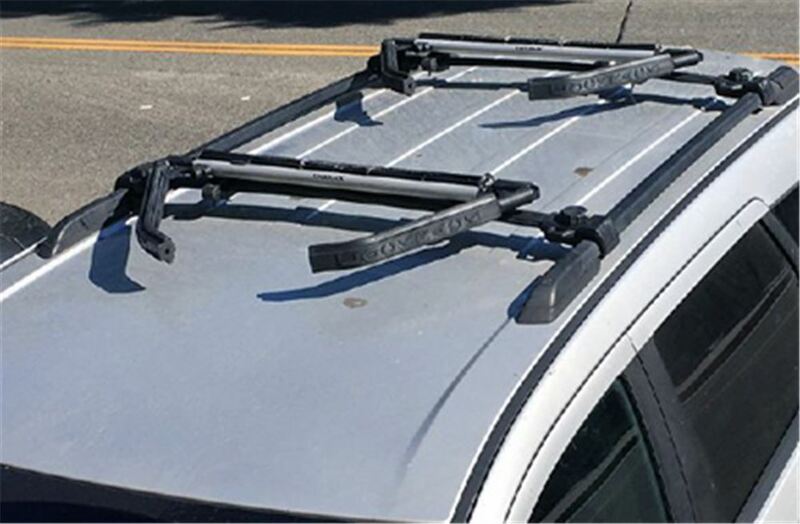 To install the rack directly into the top channels of your crossbars, attach the T-bolts instead of the mounting clamps. 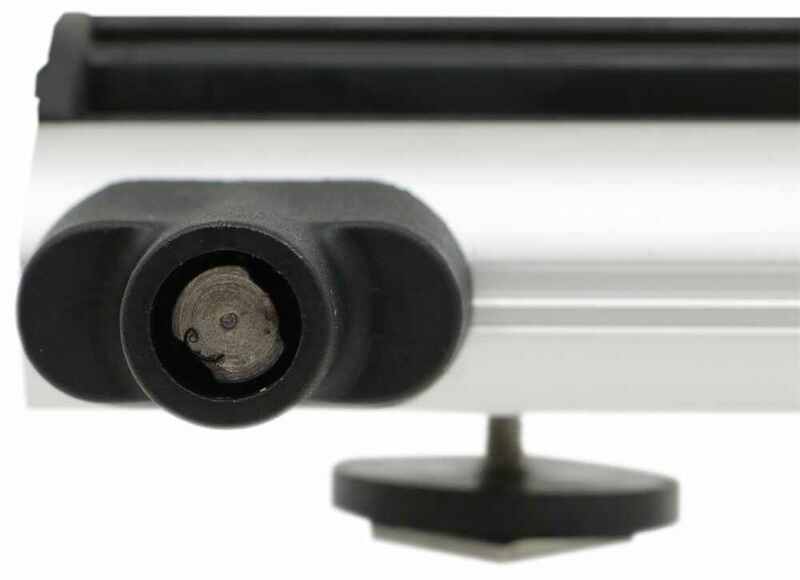 Then just slide the rack into your crossbar's channels and secure it using the included socket wrench. 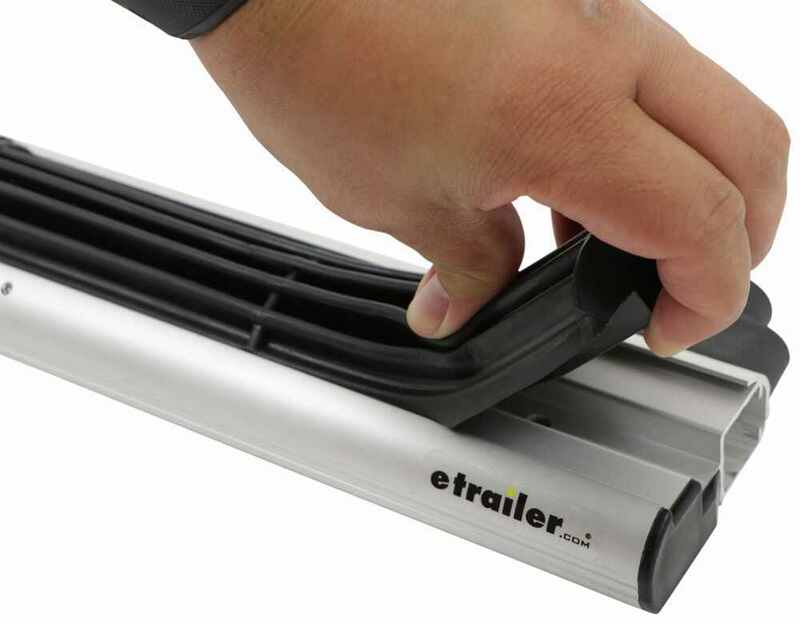 To access the carrier's mounting hardware, simply remove the rubber strip on top of the base. Watersport carrier holds gear with rubber-coated, ratcheting arms - no need for load straps. 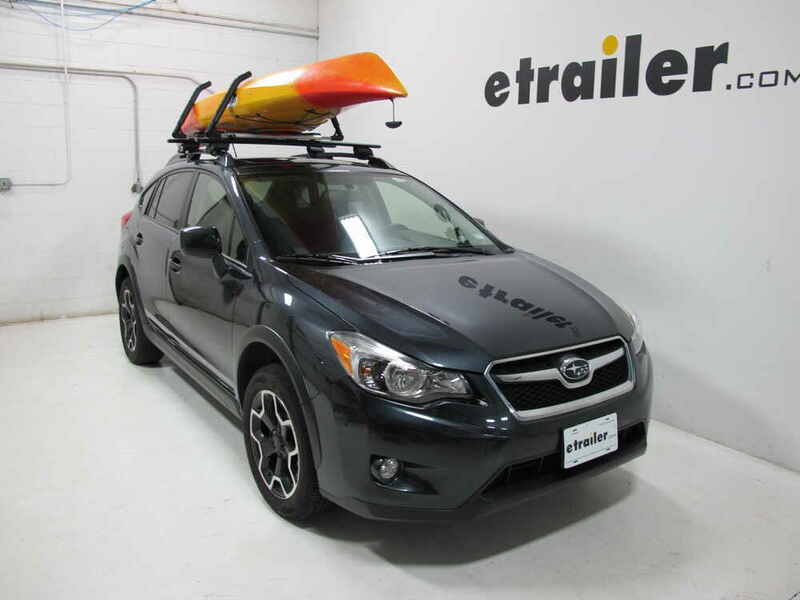 Includes locks to secure your watercraft to the carrier. Installs in your crossbars' top channels. 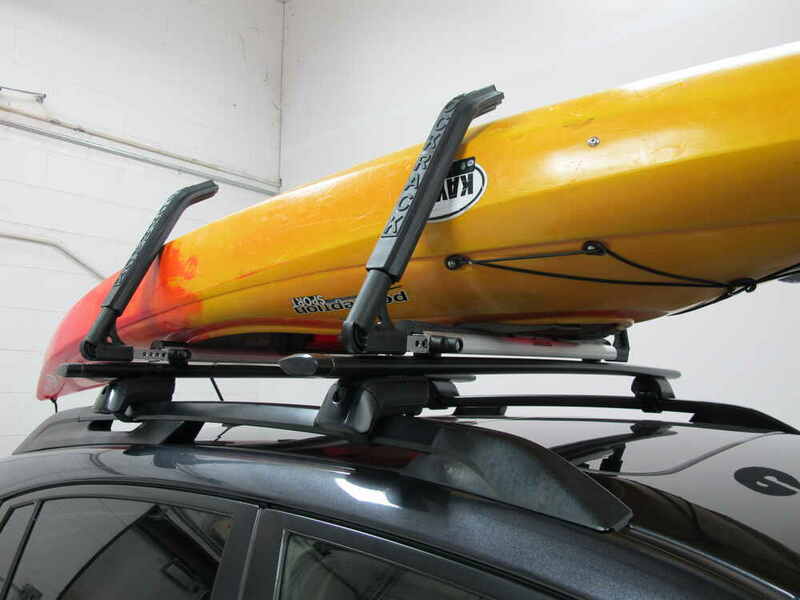 Speaker 1: Today we're gonna be taking a look at the Lockrack watersport carrier for kayaks, canoes, or two stand up paddle boards, part number 339LRUNISETA. 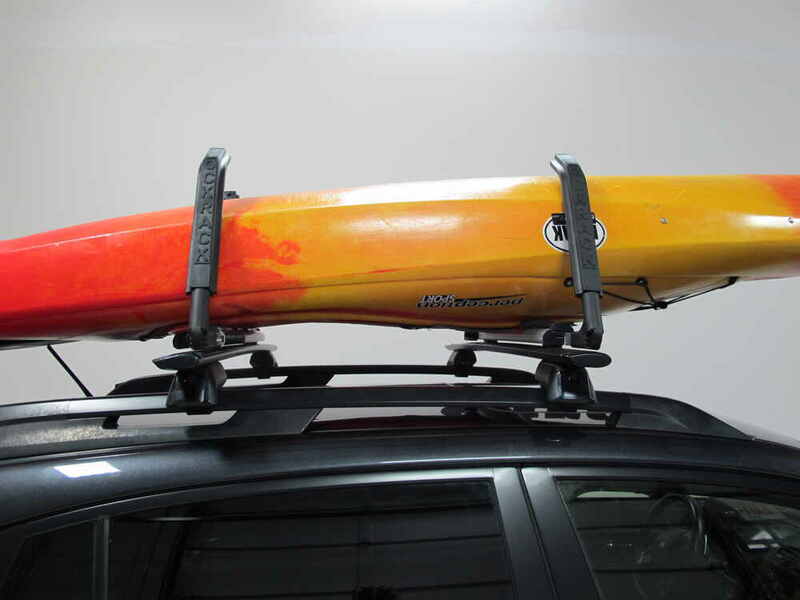 The Lockrack watersport carrier is a versatile carrier that can carry up to one kayak, canoe, or up to two stand up paddle boards, and it has the added bonus of not requiring any tie-downs once it's installed. 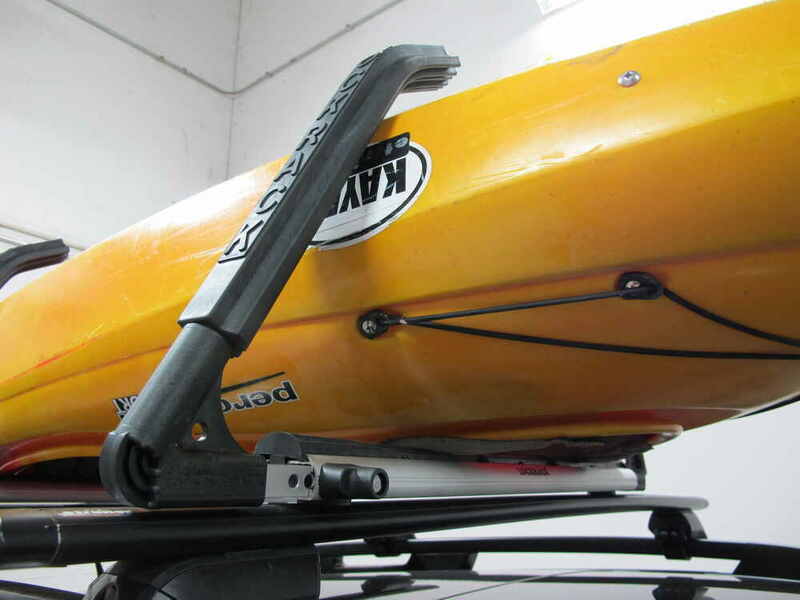 To hold the kayaks or stand up paddle boards in place, we have these easy to use ratcheting arms, and they have a rubber coating on them to help protect the hulls of both your paddle boards and your kayaks as well.This'll have four points of contact with your kayak, with two arms on each side, and it's also have these nice grips on them to ensure that the kayak doesn't shift back and forth while traveling as well. 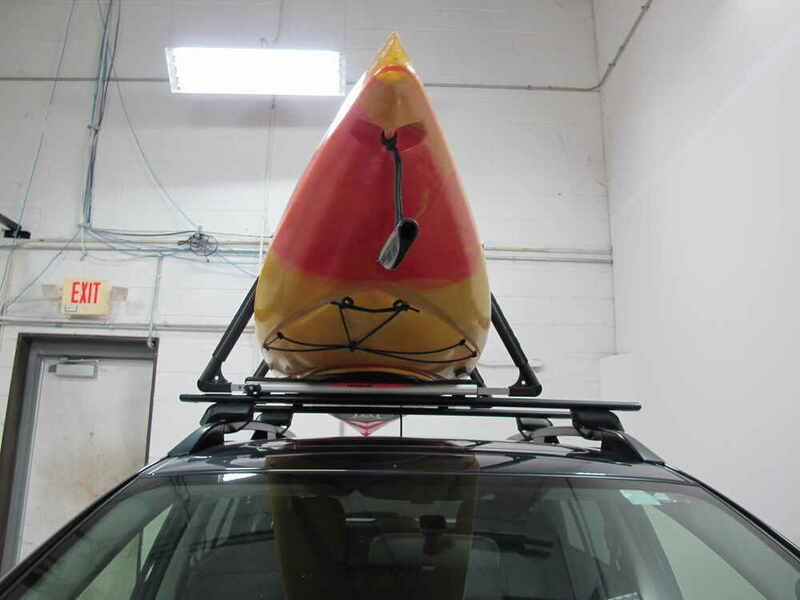 In some cases, you may have to remove the antenna, like here, because it may make contact with the kayak once it's installed. 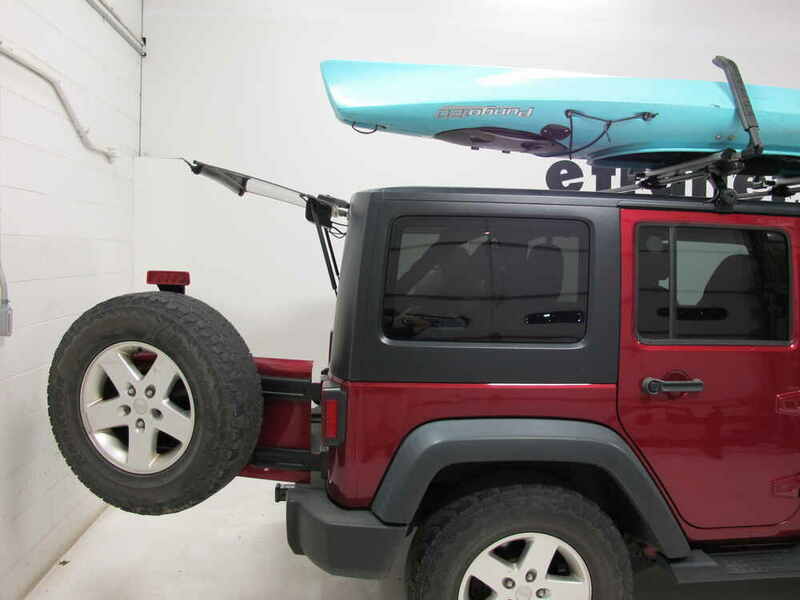 While this may work different for different vehicles, unfortunately in this case, we can't open the rear hatch because it will make contact with the kayak before it's fully opened.Once everything is installed and tightened down, you notice that you can't pull the arms back out. To do that, it does come with a set of four keys, like you see here, which inserts on the inside like so, and then you turn it, and that's what releases the arm. These keys come in a quantity of four and also have an end point here where you can attach it to your key chain. With this system, since it's side-loading, you can actually place it more towards the passenger or driver side, depending on the orientation you want. Also, depending on the bar length, once this is installed, you might be able to still install other accessories such as bike racks.We've gone ahead and removed the kayak to show off some additional features here, and one of them being, is when this is just traveling with nothing on it, this does fold flat by flipping your arms off to the side to where you see this entry point here, and just pushes into place and locks in like so, and you can do this with the rest of the arms as well. 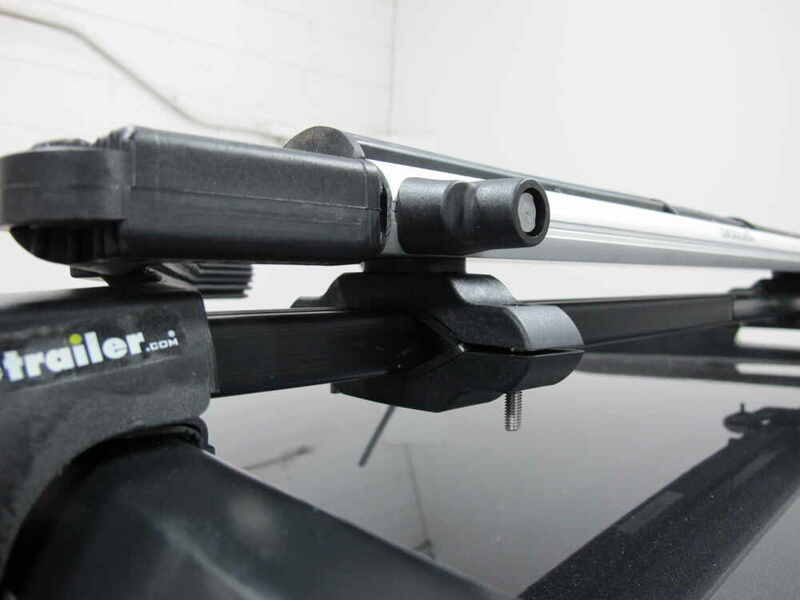 One final feature about this rack is that it is a universal mount, meaning it can work with the channels, like you see here, or if you have square, round, or factory bars, it comes with these clamps to wrap around those as well. Or, if you just wanna get the channel mount style, we do sell that on etrailer.com as part number 339LR65LASET.With the arms completely folded out and in their regular position, it's gonna be 16 and 3/16" tall by 34 inches wide. As far as the adjustability of the arms back and forth, at the base it's gonna be 27 1/2 - 41" and at the top, it's gonna be 16-29 1/2". 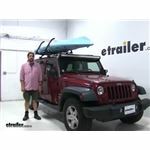 This does have a carrying capacity of 175 pounds, but you're always gonna double check with your vehicle's manual to make sure your roof can take those weights, and the carrier itself weighs 17 pounds, so it's nice and lightweight to put up on your vehicle.When comparing this with other kayak carriers, one that comes up is gonna be the Yakima Showdown kayak or stand up paddle board carrier with lift assist, part number Y04081. Both of these have a few similarities, but we're gonna be focusing in on the differences. 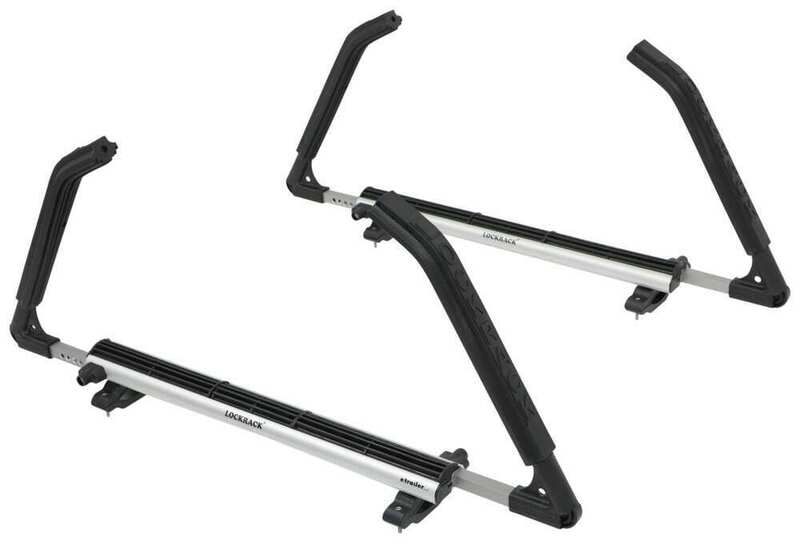 The first big difference is gonna be with the Yakama, it does have a load assist to either put your kayak or two stand up paddle boards into place. 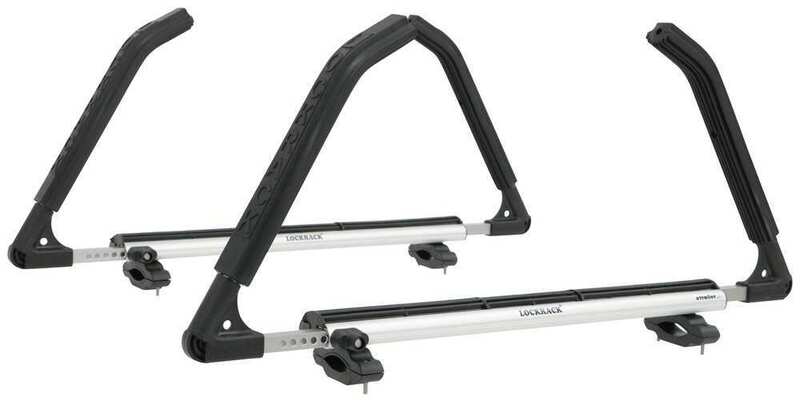 However, with the Lockrack, this doesn't require any tie-downs at all once it's installed. You get all the arms pushed in place, and it's ready to go. 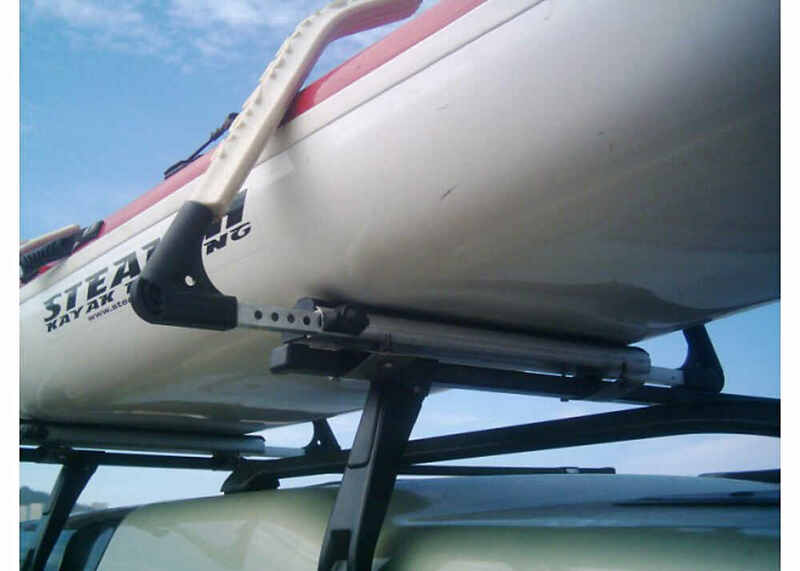 With the Yakama, you do have the tie-downs, as well as the bow and stern tie-downs to make sure everything stays in place while you travel.The Yakama does have a carrying capacity of 80 pounds, while the Lockrack has a carrying capacity of 175 pounds. So there is quite a bit of difference there. Now that we've gone over some of the features, let's go ahead and show you how it installs. 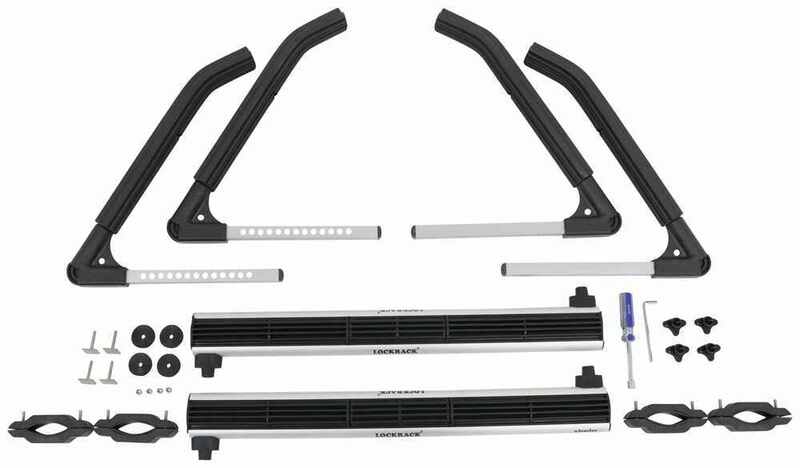 We're gonna show you both styles of how to install this on your vehicle, and we'll start with the channel mount style. First, we're gonna grab the channel mounts here. We'll go to our roof rack and start installing those bits.So take the square end on the bottom here, we'll slide it in to our t-track, here . Just push that into place, repeat this for our second nut. Remove the two nuts at the top here. Once we have our bar in our hand here, we'll make sure we'll line up the holes with our mounts. Gotta spread this out a little bit more. Now we wanna make sure it's even with our front bar. That looks to be pretty close there. Now we can tighten it down. Next we'll lift up the padding here, or remove it completely, depending on what you wanna do. We'll take our nut, we'll reinstall it, and then we'll take our included tool and tighten it down. We'll do this one this on the other side as well.Once everything is tightened down, we can take our padding and put it back underneath our catches, here, and push it back down in place. Next, we'll take our arm and slide it into our base, just until it's burst point, and then we can grab our kayak, and load it up as well. Once everything is tightened down, we can put our pad back into place. It just kinda pushes in, like so. Slip this on the pads, you're gonna put it upside down, and that also goes for stand up paddle boards as well, with the fins facing forward. We'll make sure it's even.Next we'll install our arms on the passenger side. You wanna push them in just until they make contact with the hull of your kayak or stand up paddle board. They ratchet in, then give them one final push. Then give it a shake test to make sure everything is secure, and now we're ready to hit the road.Now that we've shown you how to install this into your channel mounts. Let's go ahead and show you how it installs on square round bars or factory bars. We have the clamp style already installed in the front. We'll show you the installation process on our second bar. We have our base partially disassembled here, so our next step is we're gonna take our mount here, and the original channel mount and do a couple modifications. We'll first take our allen tool here, which is included, and we'll loosen it up. Just loosely on one side and then completely take the screw out on the other side.We'll take the top portion with the hole here, take off the pad, and take our previous channel mount, take off the plastic spacer at the top, and this slides into the bottom portion there. We'll replace the padding, and our spacer goes on the top. Now feed that into our base, like so. Reinsert that top screw, and take our included tightening tool, and tighten that down as well.Now we're ready to set this onto our square bars. Sit it down like so, making sure it's even with the front bar. Take our screw to be removed, put it back through, install our nut underneath, and start tightening it down. Then we'll go back to the other side and start tightening it down as well, so it tightens down evenly around the bar. Then we'll repeat this process on the other side as well. 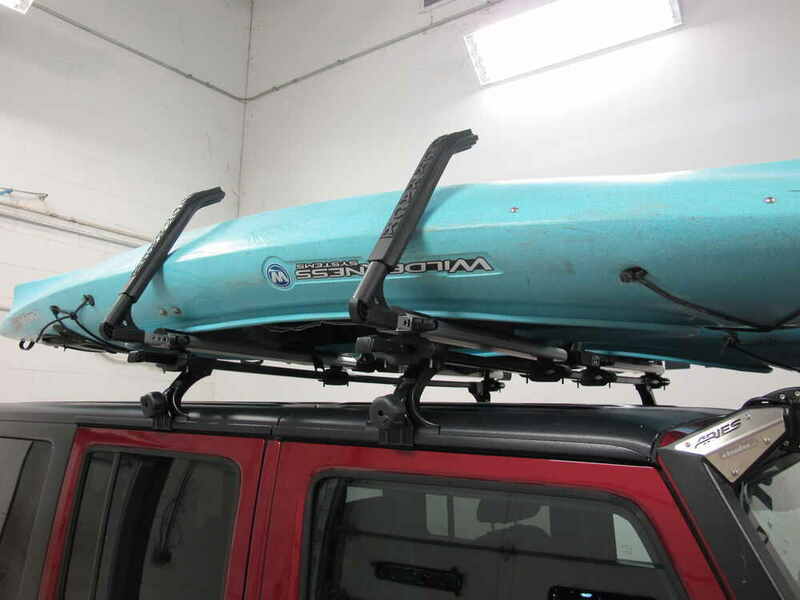 Now with it tightened down, we'll put our pad back into place, and put our arms back in, and there you have it for the Lockrack water sport carrier for kayaks, canoes, or two stand up paddle boards. Part number 339LRUNISETA. 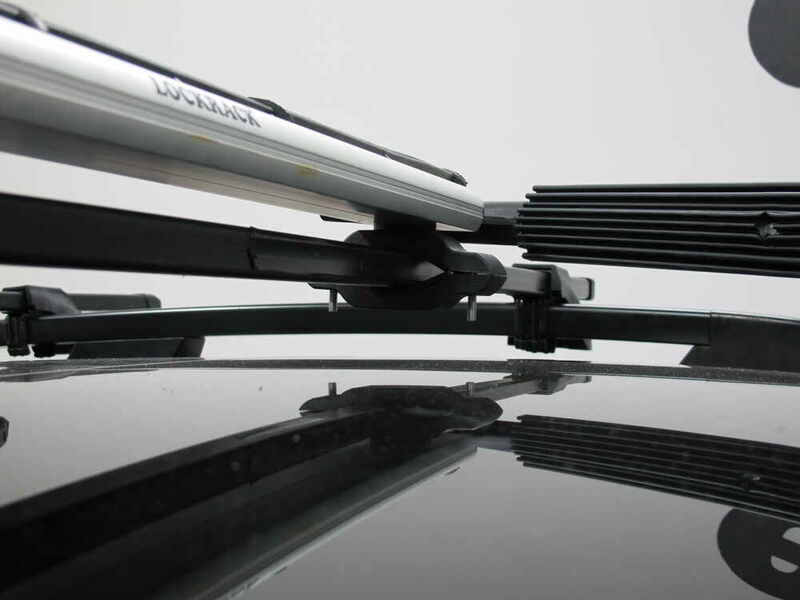 The V-Style Kayak Carrier for Malone XtraLight Trailers - 1 Kayak # MPG567 are only a fit for square bars like the Inno # INB127 or the newer Thule SquareBar # TH712200. 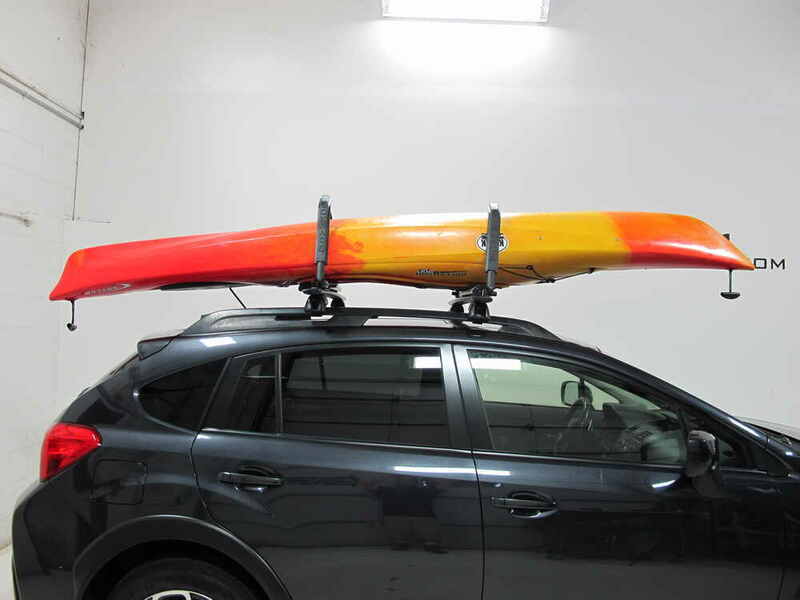 There is not a similar style kayak carrier to fit aero bars. You may be interested in the MegaWing # MPG207 or the SeaWing # MPG107MD. 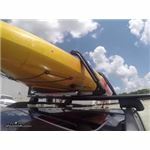 The Lockrack Watersport Carrier - Kayak, Canoe, or 2 SUPs - Side Loading - Universal Mount # 339LRUNISETA is a more sophisticated version that doesn't need the tie-downs.